Three cheers for Cleveland High School students, who had to travel a few thousand miles to complete a class project! Their destination was a remote village in Kisalaya, Nicaragua. The group of 10 students and 4 adults loaded up engineering gear (300 pounds of material for a solar-powered, 19-foot Solawrap greenhouse dome), and set off to apply their engineering skills they learned toward developing a solution for any longstanding challenge or problem. 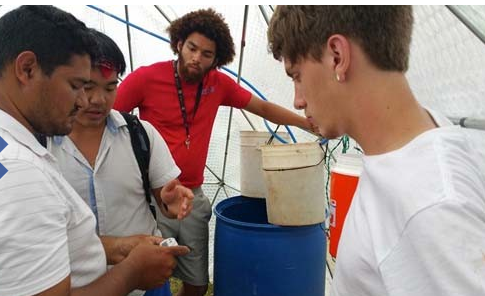 The challenge was to create a portable greenhouse-type structure that would provide aquaponic and seed-starting capabilities, along with more traditional greenhouse nursery functionality. The goal was to meet the nutritional needs for 16 people in a developing country. A prototype was constructed by the students at the end of the fall semester. When assembled, the dome is fully functioning and self-sustaining with mist-irrigation seed starting tables, a solar-charged serviceable battery, twin filtration, fish-breeding containers, a water-catchment area, and additional planting space. The dome is 19 feet tall, with a metal structure. It is strong enough for a 180-pound person to hang from the joints. Students had a limit of 10 pounds for personal luggage (considered “ultralight”, in order to travel with all the pieces and components of the dome. The dome was carried in 15 bags, every piece transported on three planes (one being a 12-passenger Cessna). There was also a six-hour bus ride, and a three-mile logging road trip to the site. A few spare parts were donated to a local administrator for the children’s home. Not only did the students build their greenhouse structure, bu they spent time interacting with local children. There were baseball games, English lessons and sightseeing. Children came from all around the village to see the dome project and meet the students.Projects such as this one accomplish so much more than just building a greenhouse that feeds a local orphanage. Group members said they returned home with a strong sense of accomplishment and a feeling anything is possible. In years to come it seems likely that this trip and all the work that went into it, will stay with everyone involved for a lifetime. Project sponsors from Worth Construction were so impressed by the ambitious and groundbreaking class trip, they donated matching funds for the students. The greenhouse installation site was provided by New Hope Global Childrens Ministries. It will aid in nutrition and feeding of orphanage residents in the remote village. Local businesses believed in the project enough to support the students with materials and donations, including SolaWrap, Worth Construction Company, HATponics, P&G Cleveland Engineering, Elder’s Ace Hardware, Cleveland Boat Center, Happy Nails and Burn’s Ornamental Iron.